Psssst . . . pssssssst. Hey you, over there! Yes YOU! The one looking super sharp in the kitchen. It. Is. Officially . . . FALL! Pumpkin candle burning, boot & scarf wearing, candy corn eating! I just may combust into flames of leaf-changing joy! Wait . . . I’m in Southern CA, and it’s still hot-as-sin, with no discernible foliage. That’s alright because Bath & Body Works & William Sonoma have used their seasonal trickery to transform my kitchen from a SoCal sauna, to a harvest-haven. Yes my friends, it’s time to COOK again! I decided to commemorate our recent equinox with a rustic pasta dish. I’m a huge fan of mushrooms, in many of their delectable varieties (well, not the poisonous death-inducing ones). We’re going to use several types to add flavor & texture. Ultimately we end up with a comforting, creamy Wild Mushroom Pasta Sauce over fresh paparadelle. Where have you been all summer?! 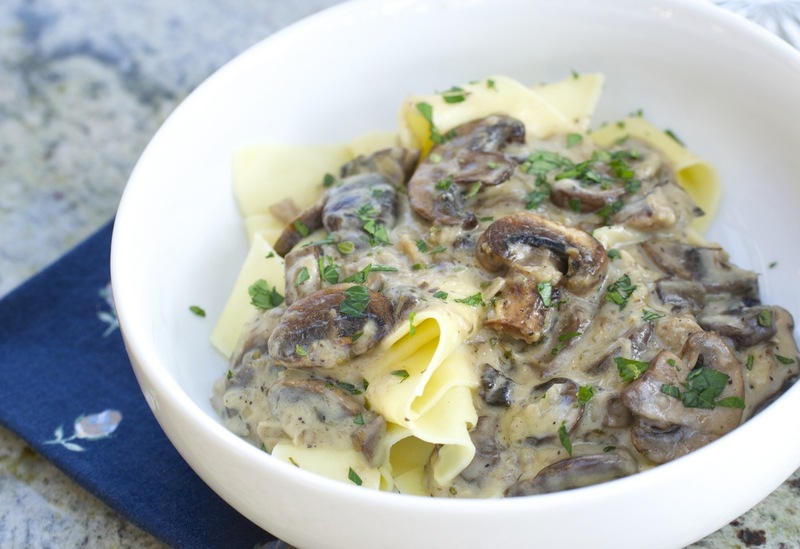 This is a rustic and rich fresh mushroom sauce, perfect over fresh pasta, easily made in one skillet. Serves: ~4 side servings or a few larger dinner portions. *parmesan cheese to top as desired. Rinse and chop mushrooms roughly (I left some smaller mushrooms sliced only, for texture). In a large, rimmed skillet or pot, melt 2T butter and sauté the shallots, garlic with pinch of salt & pepper, until tender (~5 mins). Add the mushrooms, thyme & ¼ cup wine, and continue to sauté on medium-low, letting fluids evaporate some (~10-15 mins). Make roux to thicken sauce by adding 1T butter to pan, then sprinkling ~1.5T flour over mix to begin roux, stirring to incorporate flour into mix. Simultaneously, add ~1/4 cup wine to sauce gradually, stirring continuously until absorbed (sauce should be thickened & smooth, add more wine or water if needed). Reduce heat to low and let sauce simmer, adding the fresh sage, salt & pepper (to taste), stir occasionally. While sauce is simmering, boil pasta noodles in a large pot of salted water, drain but reserve ~1T starchy pasta water and add back into sauce and stir). Fresh pasta will cook mush faster, so only make a few minutes before serving. Serve fresh pappardelle noodles with mushroom sauce on top, and finish with freshly grated parmesan & little chopped parsley. If you can make or buy fresh pasta for this, it is better, but any noodle would work! I prefer the wide egg noodles, such as pappardelle for this type of creamy sauce. This would also go well over rice, chicken or a protein. You can add different mushroom varieties if you have them available! I’ve been a devoted casserole eater most of my life. Many of those creative bakes involved canned, cream of mushroom soup. I’ve always loved the rich constancy it gave dishes, but wondered how I could achieve the same with fresh, healthier ingredients. Sorry Campbell’s, but it’s time to make my own mushroom magic. Not to mention there are so many varieties to work with—the more, the better! I chose mascarpone cheese as our creamy element, due to it’s thick, yet neutral flavor—it’s basically Italian cream cheese. I was craving a richer sauce, but without having to use a ton of flour & cream. The white wine brings the necessary acidity, and wine makes everything better. Good news (if you like mushrooms)! This can be cooked in one skillet on your stovetop. This sauce doesn’t stop at pasta, but maybe over rice, chicken . . . both? Maybe we should double-up the batch! I like paring fresh mushrooms with sage, just seems to work with the earthiness. When we combine our sauce with fresh pasta noodles, well . . . I need a minute to collect myself, it’s just that good. You won’t even miss that there is no meat. I recommend this dish for a great weeknight dinner as the days get cooler, or really anytime. Here’s to welcoming the change of season, with arms wide open!